A late goal from James Dayton was little more than scant consolation as Orient came away from Ebbsfleet with a 2-1 defeat that piles ever more pressure on manager Steve Davis. Leyton Orient returned from the short trip to Kent with their heads in their hands and yet more questions to be asked after yet another defeat leaves them remaining in grave trouble at the wrong end of the National League table. It could have been a lot worse if the fact that all 7 of the bottom 8 teams that were in action on Saturday happen to lose! Leyton Orient remain in 19th position and the bottom 6 remain in the delicate position of potentially being stranded and left to slug it out for survival in the division. An attendance of just over 2,000 saw the O’s cave in once more as their winless run stretches back to the first week of September when they climbed up to second. The fact they have plummeted 17 places in a dreadful run of form causes major concern for a team many expected to be challenging for automatic promotion in their first ever year out of the Football League. This result could impact into some changes with Director Matt Porter describing their form as ‘simply not good enough’ the day before the game as the Londoner’s winless run now stretches to 11 games after this defeat at Ebbsfleet. BT Sport televised the game and every time Orient have been televised this season has seen a below par performance from the team and this was certainly no different as Stonebridge Road hosted Leyton Orient Football Club for the first time in it’s history at the Kuflink Stadium and saw the O’s surrender to 4 defeats out of 4 in front of the television cameras. Once again manager Steve Davis rung out the changes with a whopping 5 changes this week from last week’s defeat in which the desperation of trying to find a winning formula appears head and shoulders above any kind of consistency in the team. Fair play, top scorer Macauley Bonne missed the game due to international duty with Zimbabwe and Davis included the return of loan players Mark Ellis and James Brophy whose clubs did not allow them to be involved in last weeks FA Cup duty. So to a degree Steve Davis had his team formation hand played for him to a point. 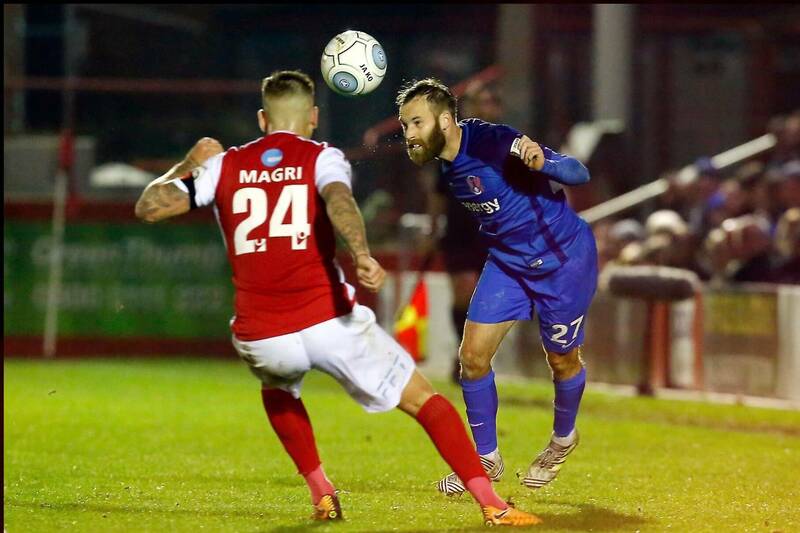 It was the second time in a week that Orient had made the relatively short trip to Kent following on from their 2-1 knockout loss to Gillingham at the Priestfield Stadium last week and with Ebbsfleet United coming off the wrong end of a 6-2 pummelling there was some hope for the visiting O’s fans. Unfortunately this was extinguished as early as the 6th minute as the home side’s tapped home with ease by the lurking Andy Drury. It was a lovely goal as one metre tap ins go. Myles Weston pinged the ball into Drury’s feet, he slipped Luke Coulson through with a clever first time pass and then got into the six yard box to convert Coulson’s low centre from a yard or so out depending on if you prefer old money or new money. Orient didn’t collapse though and Ebbsfleet’s goal seemed to spark the O’s into life and they were the better side for much of the first half and Matt Harrold almost equalised with a header that was superbly pushed against the post by Nathan Ashmore. James Dayton came in for the rebound but Kenny Clark got back to clear off the line. The London team continued to press and Dean Rance threw himself in front of another James Dayton shot before Ashmore arched his back to tip a Harrold header over the bar. The home team’s defence was under siege for a while but they saw out the storm and began to see more of the ball as the half wore on. Orient failed to clear a Weston cross but Drury’s volley from outside the area looped over the bar. Five minutes before the break, though, Fleet made it 2-0. Connors’ ball down the line released Weston and his cross was powered into the net by the head of Kedwell. Rough for Orient who to all intents and purposes were the better first half team so to go in to the break 2-0 down was harsh and James Dayton’s wonderful shot 3 minutes before the end of the game was no more than a consolation as Orient suffered yet another loss.